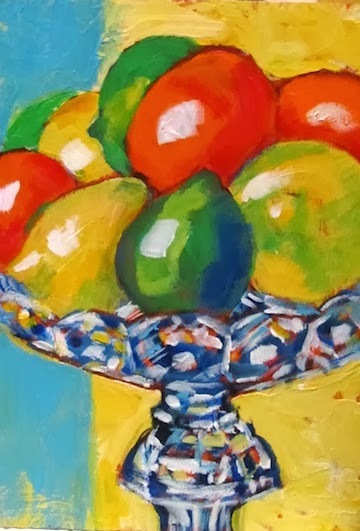 Barbara Muir Paints: Cure for the deepfreeze -- Hot lemon! sisters, mandarins and limes. It's all good. would be certain to make us forget the cold. It's minus 25 Celsius here tonight. Labels: Still Life. Lime in the middle. Barbara Muir © 2014. Toronto.Canada. Yes! For sure a pick me upper. That concoction sounds tempting - and the still life is every bit as inviting. As for the lime in the middle I give the pie maker in your family permission to make key lime with it but not until you've released it from posing that is. Of course It's no wonder you're a bit tired with the schedule you keep! I'd be flat out doing half as much. I should be ashamed to admit it, but I'm not. The limes in our house never get around to much more than posing. We are more likely to consume the other citrus friends. The limes come in as a visual accent, and only if a true lime lover visits do they make it into the side of a drink or limeade. Okay I am starting to feel a bit guilty.